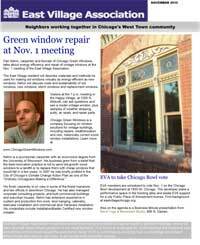 The Monday, Nov. 1 meeting of the East Village Association will include a presentation on vintage window repair and a vote on live music at Chicago and Wolcott. Details are in the East Village News for November, which can be downloaded here. Other features: a potential plan for the former Pizza Hut at Division & Ashland and a look at West Town property values.